Isosonic Dekfloor 30 is a new prime addition to the Thermal Economics Isorubber product range. The board component, Isosonic Dek 30, forms a combined sound insulation and structural deck, applied directly to the floor joists. It is composed of an 8mm Isorubber resilient layer bonded to V313 chipboard. Isorubber itself is a dense, durable, low compression material with excellent impact and airborne sound properties. It forms the main acoustic component of six Robust Details. Its mass, which reduces airborne sound transmission. Its dynamic stiffness, which prevents compression (loss of resilience) at the board to joist interface. 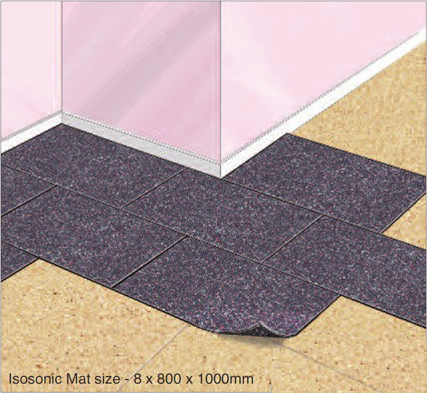 The system is designed to reduce flanking sound leakage around the floor perimeter; a frequent problem in refurbishment work. It also employs the Isosonic Ceiling range of vibration absorbing hangers, brackets and cleats to facilitate the acoustic decoupling from floor to ceiling. Isorubber Mat is made from crumbed, reconstituted waste rubber. It is a very tough and durable material with a high density (900Kg/m3). It is supplied in an 800mm x 1000mm format in thicknesses of 8mm and 12mm, weighing 5.8kg and 8.7kg per mat respectively. A combination of resilience and density provides Isorubber Mat with excellent airborne sound, impact sound and vibration absorbing characteristics. The choice of thickness is governed by the level of airborne sound and vibration absorption requirements. To provide a fast and simple means of substantially improving the sound insulation of floors, via an easy to install surface overlay. Approved Document Part E standards may be achieved when Isorubber Mat is used in combination with our Isosonic Ceiling decoupling systems. To provide vibration insulation under machinery and domestic appliances. To provide general contact protection and shock absorbing surfaces for sports and play areas. Isorubber Mat can be used as a direct underlay for hardwood and laminate flooring. Due to its high density, Isorubber Mat undergoes virtually no compression under normal residential design loading. For further details please refer to www.thermal-economics.co.uk or call us on 01582 450814.